“What is that?” Nicholas peered over at the tool in my hands. Glancing down, I automatically replied, “It’s called a ‘hoe’ and then I found myself taken aback. For the first time, I think I actually looked at the instrument held in my hands. It’s simple beauty struck me. “It was my grandfathers,” I continued. I remembered grabbing it from a Florida garage some time after his death as a tangible connection to the person who helped raise me as a young child. After beginning its life on farm in Ohio, the hoe now worked with me on a small school garden field. Today five year old Nicholas catches a glimpse of it for the first time- I’m sure my own father at the same age shared an intimate relationship with the hoe as a contributing member of life on a farm. “How old was he when he died?” Nicholas inquired. “My grandfather was 71. He died two years ago.” Nicholas continued to hold my gaze. Taking a break, we sat down on the picnic table sipping from our water bottles. 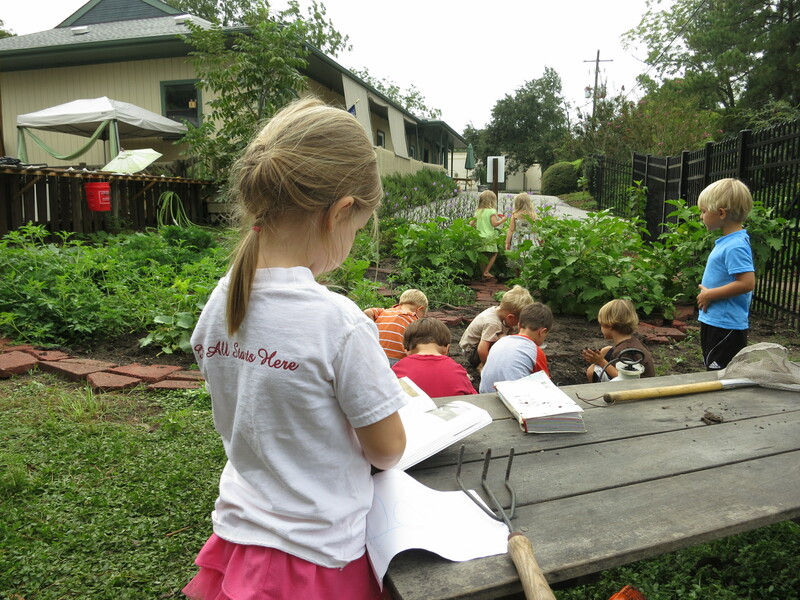 Our conversation continued as we swapped grandparent stories and gradually returned to our garden. I picked up my grandfather’s old hoe and put it back to work while Nicholas gathered the upturned weeds left in its wake. Together we grew silent concentrating on our individual tasks at hand. “What a genius.” I thought- still not knowing if in reference to Nicholas, Maria Montessori, or nature itself. The best moments in your baby’s life are often not caught on camera. When you recognize it, you know – leaving to get the camera will miss the event. Or disrupt it from happening at all. The frustration of not being able to get to your camera quickly evaporates and after a deep breath, you are free to be the sole witness, etching the moment in your long-term memory bank. As a bonus, that fully aware sensitive observation also effortlessly provides you with the necessary information to meet your child’s needs. Trapped as an observer without a camera, the adult notices even at play, a baby will need a preferred adult’s guidance to check in with to see that where they are is a good place to be; to share in an accomplishment; to hold onto an assortment of gathered objects; to know when they have reached their physical limits cognitively, emotionally, socially, and physically. And to provide the necessary support -not to rescue her- but to build the confidence in her own capabilities to keep moving forward. While the best moments in your baby’s life are often caught off tape- sometimes you do get lucky. Here during a demonstration of what might be a five minute sensitive observation by a caregiver, we almost overlook the baby in the back at play with his bowls as little girl in the foreground connects with her primary teacher. But then, as she moves off screen, something special happens- a child’s new discovery of the properties of nature. <iframe src=”http://player.vimeo.com/video/45944630&#8243; width=”500″ height=”281″ frameborder=”0″ webkitAllowFullScreen mozallowfullscreen allowFullScreen>The Scientist at Play from MMP School on Vimeo. Maslov ranked Sense of Belonging before Self-Esteem on his hierarchy of needs. Meaning that without a social context in which a person can validate his perceived worth, self-worth is not internalized. Yet we often witness groups of young children being reconfigured each year without regard to established relationships at the start of each school year. It is with schools- both at the early childhood and elementary levels especially- that affords the best opportunity to establish community and sense of belonging. A strong sense of community provides the foundation upon which a child can develop the degree of her self-regulation to temporarily place her own will aside even for the benefit of the group to which she belongs- collaboration. In doing so, the child is rewarded internally by a deep satisfaction his contributions have provided to the whole- a deep feeling of worth he would not have been able to receive by simply attending to his own needs.